The good, the bad, and the bizarre. Part-time Uber operator Andrej Mrevlje offers an honest, intimate take on what it's like to work with the controversial ride-sharing platform. WASHINGTON D.C. — I have been an Uber driver for a few months now. As a rule, I don't drive more than three days a week, for three to four hours a day. If you want to hire me, my Uber app will show you that my rating is 4.82, which puts me in the 90th percentile of five-star Uber drivers. But that figure doesn't mean much; the hard-earned rating can be turned into dust with one rider's negative evaluation. When a driver's ratings reach the red line — meaning an intolerable 4.6 — Uber starts monitoring the driver, and they can easily be "deactivated," the Uber term for being fired. How can one slip from high to low in an instant? It happened to me one lovely spring morning when exploring a new, off-track neighborhood. I don't remember her name, but she was an Asian lady, and her name was western. As soon as she sat in the car, I knew that it was not going to end well. "Why are you going straight? You should turn right," she ordered as soon as we started our trip. I was only into the second week of my driving, and a ride from Washington D.C.'s NW area across the river into the forest-like Virginia countryside, tangled by highways, is different from merely crossing a neighborhood. And the lady passenger, sitting comfortably in the back seat of my car, was enjoying her controlling position. As an Uber driver, you only have one option: You either know the city like the back of your hand, or you follow the instructions on the navigation app. There is no middle way. It doesn't work to combine the two while driving. Our brain is too slow or the terrain blends poorly with the virtual reality of the app, though it must be different for an observer, as the lady presently behind my back, who knew the road very well and was comparing it with the app on her smartphone. And loving it. So when I took a link road that was supposed to get us on the bridge and then on the other side of Potomac River, into Virginia, I found myself in front of a barrier, with the sign that read, "Closed Road." "They closed it today?" I asked myself. The lady read my mind: "They close it every day at this hour in the morning," she said knowledgeably. Moron! Great, I thought. "Any other surprises?" I asked as I made a U-turn, looking for an alternative road. "No, you're fine," she said, probably enjoying my account profile. There were a couple more little corrections from my passenger, disputing the navigation app I was using. I don't mind when views are shared and debated, but snappy orders make me nervous, mainly because I did not know how reliable they were. The lady was using her daily experience with the road, which clashed with my app. She was testing me, but was it me who would fail, or my app? We got on the same page as we drove down I-66 for a few miles. Then, out of the blue, she ordered me: "Take this exit. I am taking over from here!" We went off the charts, strayed from the planned, requested destination. She gave Uber a virtual address. Uber's computer system must have gone crazy when we veered from the planned direction and turned onto a smaller road that leads us through a forest. When we arrived at the guarded gate, I could not resist asking where we were. "A government facility," my passenger answered sharply. "Drive to the gate and say to the guard, 'it's a drop-off,'" she instructed me. I did. One hundred yards later, within the gate, my long desired drop-off happened. But before I was finally free, I had to ask: "How do I get out of here?" There were only a one-way road and another guarded gate in front of the car. "Drive straight, then make a U-turn." I did, but the four guards with their heavy machine guns looked at me as I fell from the Moon. "I just want to turn around and get out of here," I explained to the stern faces dressed in black, lifting their guns slightly. The U-turn was right next to them. I could not see it, terrorized as I was by the situation. When I was finally free, I did not turn back or try to remember the location; I wanted to forget the place as soon as possible. Then the app called me with a one-star evaluation. And since I was a beginner, my average rating fell from 5 to 4.67. I went straight home, took a shower, and an hour later went back on the road, trying to understand what happened. Driving for Uber is about figuring out the function of the platform, the population of riders, their characters and behavior. When taking an Uber, millennials, for example, are typically glued to their smartphones and their ears are covered with headphones. They want you to be efficient, silent. Drive. Don't bother me. Just get me there. I don't care how much I pay. Considering that an Uber driver never knows the estimated charge Uber signals to the riders before they hop in your car, the rider and drivers are on different planets from the very start of the ride. The same goes for when riders request the Pool or Express Pool. 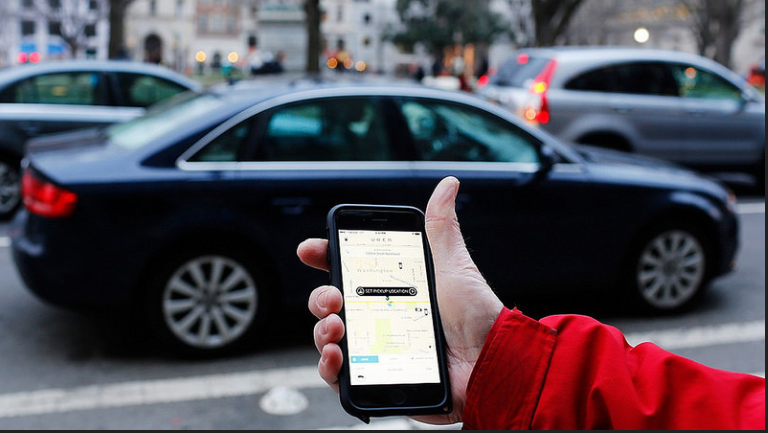 While it is useful and substantially cheaper for the riders to share an Uber, dividing the cost of the ride, the driver doesn't know the destinations and the number of passengers beforehand. Once you accept the rider of a Pool ride, you will be circulating in the area until your car is filled with other poolers. With everybody on board, the driver then has to follow Uber's instructions for the driving destination and chronological order of drop-offs. This is a time when you have no control whatsoever over where you are driving, or who is getting off first. You become an impure machine, navigated by the Uber computer platform. Sometimes, Uber turns you into a public bus. It happened to me once, when I dropped two of the four passengers off, and the Uber app called in to inform me of the addition of new passengers nearby. You have to pick them up first before dropping the others. Uber allows you to ride 12-hours a day, but I do not see how one could do this. In this case, the late-comers were sweet, kind passengers. I picked them up in front of a Giant supermarket, where an old man with his caregiver had done the weekly shopping. They had a full load of plastic bags and the car transformed into a food bazaar, smelling of groceries. The much younger passengers rolled their eyes, and I witnessed some of the useful social work that Uber does. For example, when the Express pool allowed a very poor or young person to schlepp himself from south to north Washington DC for a few dollars. It pleased me to think of this accessibility, happy even, if not for the very poor pay the drivers get on the end of what usually is a long drive, consisting of racial, generational, and social tensions. How does one deal with this? How can a driver handle this kind of situation within his car and pay attention to the road? Uber expects his partner drivers to entertain the riders on top of this. What kind of music do you put on, when your car is full of Brooklyn designers and a couple of very young and intimidated Japanese tourists? In my weeks of driving, I accumulated some experience. My first rule is not to get on the road if you are in a bad mood, just as one cannot go to a gym when he does not feel his body can make it. Driving Uber is kind of a gym, an exercise that makes you do something that, at least in my case, you don't regularly do. Uber allows you to ride 12-hours a day, but I do not see how one could do this, be safe, and be pleasant at the same time. Also, for the above reasons, I do not favor pool driving, but occasionally I do it because it makes you feel you're volunteering for a good cause. It's not about the money, forget about that. Still, I think Uber should not force drivers — as it does in some US cities — to accept pool rides. Still — and I will write more about it some other time — Uber is impressive, at least in D.C. Drivers included. There are very few of those preposterous black SUV drivers. In D.C., the majority of Uber drivers are regular people, like retired professors or people who drive from Baltimore for their jobs in D.C. and who drive Uber to cover some of the expenses or pay their mortgage. It's also true that there are Uber riders who need transport in specific areas and at times not covered by public transportation. I find this the most rewarding part of Uber: connecting the individual dots, getting them from isolated places closer to the areas that can give them a chance to earn for their lives. There is no state, no government that could organize public transport in such a capilar way as this well-organized platform. My first rule is not to get on the road if you are in a bad mood. I find this exciting and, it seems to me, at least, that many people are starting to leave their cars at home now that they can take an Uber from place to place. Ubers are even dropping people off at undisclosed government facilities. I hear hedge fund managers discussing billions in my car while their three, four vehicles are left behind, parked in front of their extravagant country house. If you find yourself around 6 a.m. nearby one of the big hospitals in D.C., you may spend a couple of hours driving the nurses who work crazy hours in emergency rooms. And while hedge fund guys are stressed and blaring on their phones the whole trip long, the early riser — or as I call them, the first responders — don't utter a word. These people are tired, and they need time and light to wake up. What intrigues me entirely are the social grids that determine the logistical, the transport and communications among the different segments of the population. If I, as an Uber driver, position myself in one neighborhood, it is very much plausible that for a couple of hours I will be circulating within that social strata. It is likely that if on the first ride, depending on the time of the day, I take someone down to Foggy Bottom, where the State Department is, then I can be almost sure that I will stay in that area of the city for a while and circulate within the circles of government people. Likewise, if your first drive brings you somewhere around Arlington, you will most likely gravitate deeper into Virginia, until you get on the highway or turn your app off to be able to return to the city. It's the diversity that makes Uber exciting and stimulating. It's getting to know the people and their stories — why did that Greek woman marry a Vietnamese guy? — that makes you love this city, this drive, and this life.